NASA’s Voyager 2 spacecraft gave humanity its first glimpse of Neptune and its moon Triton in the summer of 1989. 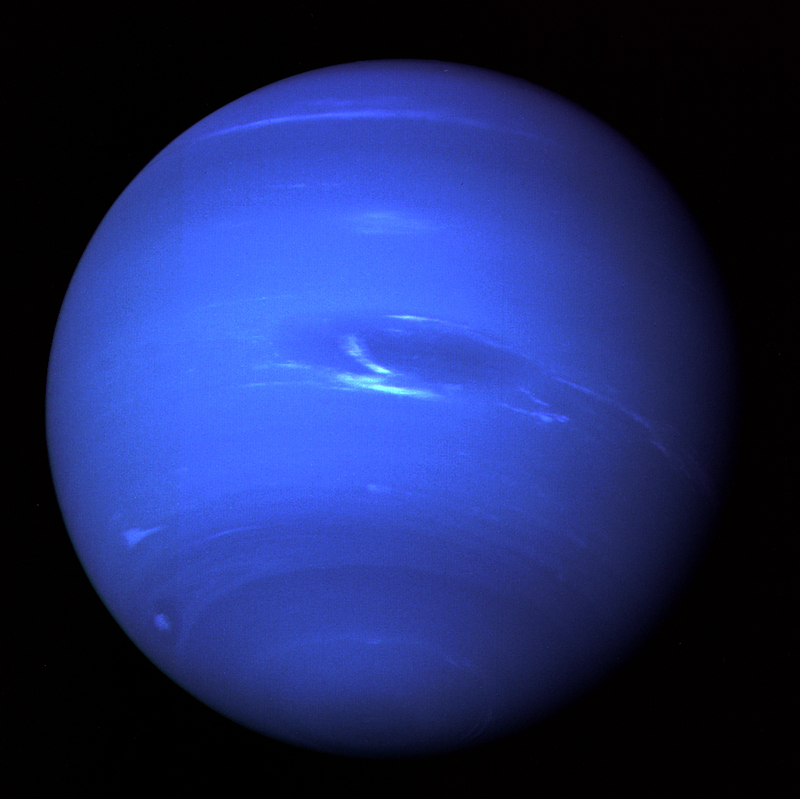 This picture of Neptune was produced from the last whole planet images taken through the green and orange filters on the Voyager 2 narrow angle camera. The images were taken on Aug. 20, 1989, at a range of 4.4 million miles from the planet, 4 days and 20 hours before closest approach on Aug. 25. The picture shows the Great Dark Spot and its companion bright smudge; on the west limb the fast moving bright feature called “Scooter” and the little dark spot are visible. These clouds were seen to persist for as long as Voyager’s cameras could resolve them. North of these, a bright cloud band similar to the south polar streak may be seen. In the summer of 2015, another NASA mission to the farthest zone of the solar system, New Horizons, will make a historic first close-up study of Pluto. Although a fast flyby, New Horizons’ Pluto encounter on July 14, 2015, will not be a replay of Voyager but more of a sequel and a reboot, with a new and more technologically advanced spacecraft and, more importantly, a new cast of characters. Those characters are Pluto and its family of five known moons, all of which will be seen up close for the first time next summer.